I've got a very special pattern for you this month. It's another bag, but this one is just a little bit different, with some new techniques for you to try out and a different look to most that have come before. You'll need accurate cutting and sewing skills for this one and there is a little hand-sewing involved. It's worth the extra effort though to make such a pretty end result, and a bag that can be used in lots of different ways. With slip and zipper pockets so you can keep everything organized and secured. Great design with a contrasting strip that disguises a slip pocket in the front. With 45 minutes of video tutorial on this bag, its quite a long project, but I want to make sure you are with me every step of the way to get the best possible result. You can see more details of the bag at the start of the video before we go onto the sewing section. 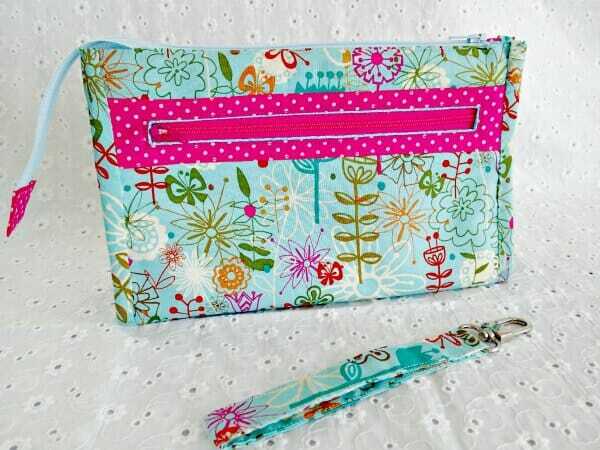 You should ideally have experience in cutting and sewing bias binding edges, and in neat hand stitching. 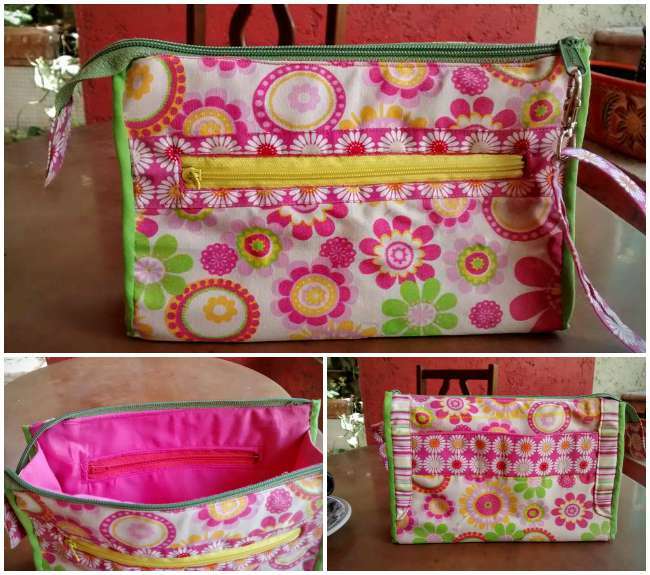 Betty Anne of The Kitchen Closet – I thought it was a very nice looking, good structure and well put together bag. The little accent pieces really stood out, and I like lots of pockets. 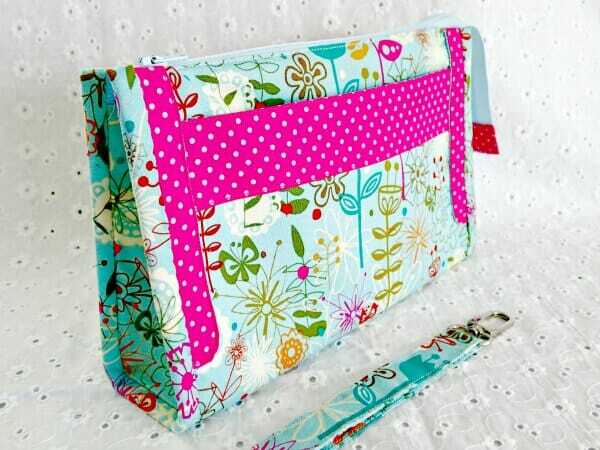 Another fantastic Bag Deby, I really enjoy sewing your patterns , this one was a good refresher for my hand sewing, all the little details and extra time put into this bag , made for a beautiful result. 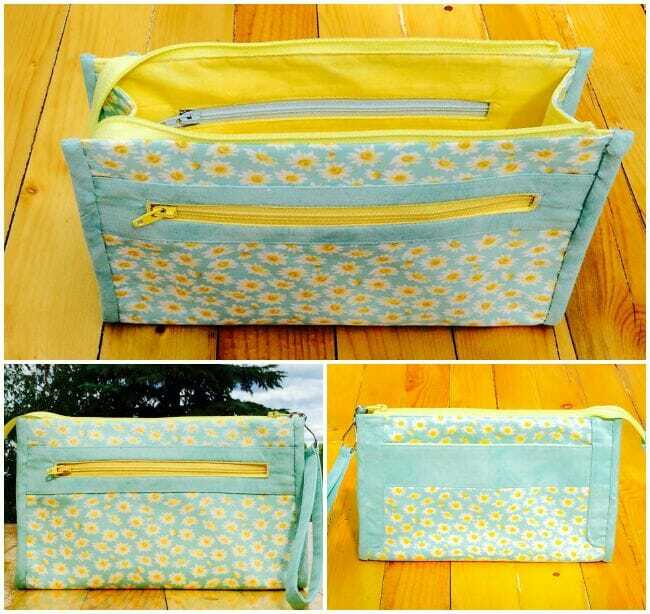 Louise – I really liked the outside pocket zipper and inside pocket zipper. Not to thrilled with bias tape, one of my least favorite sewing things, but it turned out very nice. I'm glad the instructions suggested the hand basting, I like hand-basting to hold things in place before stitching. Thanks! 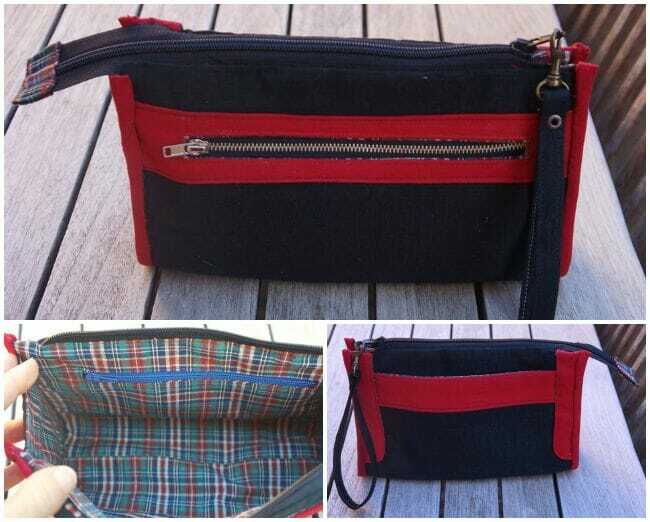 Sue at Fadanista – I thought this would be a really useful bag and I loved the design, with the sturdy base and sides. 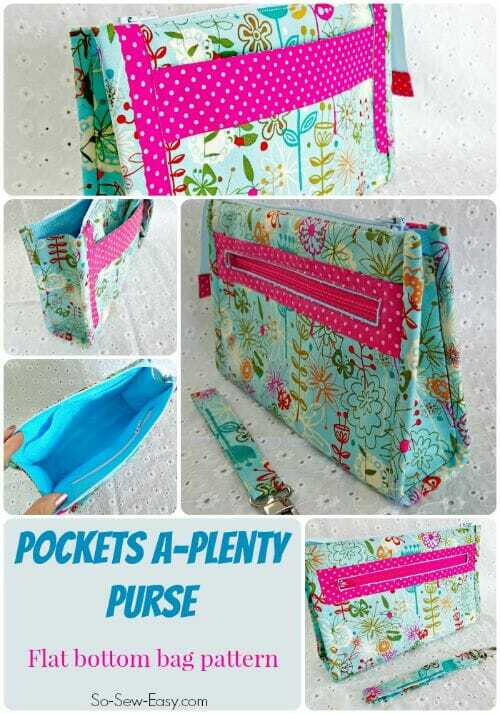 I like bags with lots of pockets and this one doesn't disappoint! The instructions are very clear and the pattern worked brilliantly. Margaret – What a lot of pieces. I love how detailed everything was. Never had anything with labels before, nice idea. Learned some different techniques. Have always previously decided away from top zippers as never had much luck, but the finished product looks amazing and professional. Lori – Cute shape, love the pockets on front and back… A little tip for the gussets. I sewed corner to corner bottom edge 1/4″ and tacked at beginning and end…then I used zipper foot to sew on both sides and binding..was little bit easier for me, no hand stitching involved. Theresa of the DIY Page – The ready-printed pattern piece labels really made a difference in keeping track of the pieces. I like to keep my essentials in an organizer that I can move from pocketbook to pocketbook but also wanted one that I could use as a small purse too. This fits the bill perfectly. I did make my strap wider to show off my the one inch daisies. The hand sewing was much easier than trying to struggle with the sewing machine. 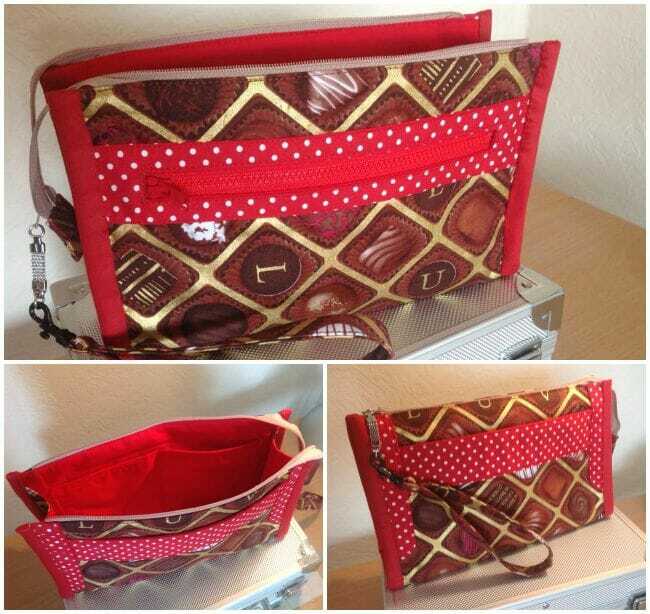 Sheri of Sassypants Satchels – I loved the contrasting panels on the bag, gives it a lot of punch! I liked the shape and thought it would be a great make-up bag. Thanks for an awesome and challenging pattern! I debated between calling it intermediate or advanced, I think it's partway in between. Those gusset corners and the bias tape, although normal bag-making skills, are always a challenge to get looking neat in the end. But it all worked well. Thanks for this tutorial which I found on YouTube! Couldn’t get your pattern as I live in India, but guesstimated the dimensions and this is what I came up with… apart from a couple of errors re depth of pocket, didn’t turn out half bad ;). Final size was 10x6x2.5 inches. I am asma from malaysia..
HI Asma, Lovely bag! Malaysia is such a beautiful country. I lived in Kuala Lumpur for 6 months a long time ago and people thought I was local 🙂 wish I spoke Malay. I love this bag. I have made 2 so far. I did however make the strap longer so I could hang it on my shoulder. I made 1 black and white and 1 red and black and white. Awesome video! Can’t wait to make one! Thank you. I can’t wait to get started. I miss you on Saturday mornings, on PBS. 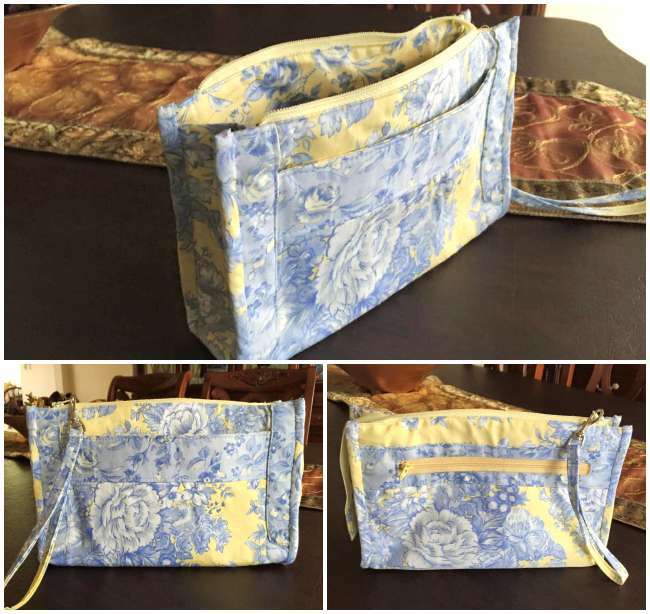 From Stellenbosch, South Africa: Thank you for the great pattern – I can never have too many pockets – I look forward to make it, much appreciated. Hi from Canada..thank you for sharing the pattern with us…can’t wait to get started on it. Although I already have Craftsy Unlimited, I appreciate the opportunity to have access to the multi-pocket tote. I have been looking at it and hope to make it in a couple of months! Thanks for this pattern and tutorial. I have my Christmas Presents all sorted now. need a pattern to work from. I am sure this is going to be a winner! Keep up the good work. Awesome project. Thank you for sharing with us. Just wanted to say “thank you” …….as I live in England I couldn’t use the link but I really appreciate you offering this as an alternative. Can’t wait to try it out! Thank you so very much for your kindness not your fault Craftsy didn’t explain themselves properly. I really appreciate the information you regularly send and all the help you offer so freely. Thank you so much for this pattern. Never made a purse before, but I’m going to try it with this lovely pattern. Have you done this bag in a light leather? If so, did you line the bag with a cloth liner? What weight of leather have you used? I haven’t but what a great idea. 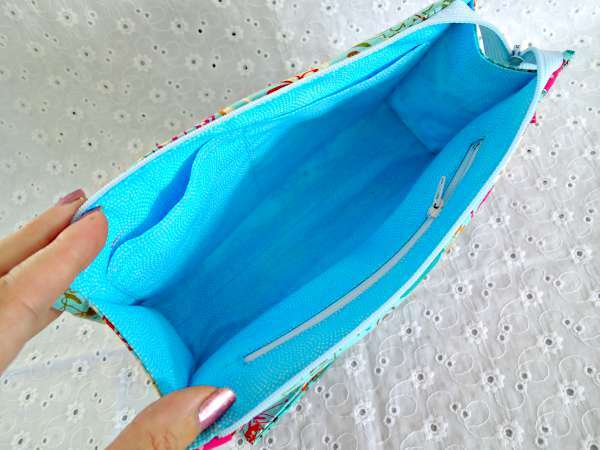 Basically, you will have to make a pattern of the inside of the bag. I do not have a tutorial for this project at this moment. Hi Betty, thank you for the feedback, i am afraid is a server issue and one we are not yet have found an answer to. It happens when there are many people on the site. We will try to rectify soon. As for Craftsy they also have huge traffic. Please empty your cache and browsing history then try again. Do this once a week to speed up your computer. I need a new bag, mine is falling apart. This is perfect!!! How do you become a product tester? Send me an email to mayra@so-sew-easy.com with your contact details and your level of skill, as well as the products you are willing to test: size, Menswear, woman wear or bag and accessories or open to all. Also I will need your social media account or blog name so I can give you credit. No I’m sorry Dixie, because of where I live, it would just cost too much money for me to print and send it to you in the mail. Usually places like your local library are happy to print for you, or stores like Staples, photo shops etc. You can take the file to them to print and get it right away. I use Staples. You can send pdfs and they will print for you. I haven’t watched the video yet, but the purses are beautiful! I would need mine a smidge taller, to hold my iPad mini, (it measures 5.5″, and I assume your measurements are for the outside) but I’m sure it could be adapted. Or maybe I could squish it in, seeing as it’s several inches deep. Will one of you girls try it? Thanks. I love designing things like these, but sometimes it’s fun to just let someone else figure out the details, and just use their pattern. Especially when it’s so cute! I also love watching your videos; that’s how I discovered you. I stumbled upon you on YouTube. In my 10 plus years of sewing I have only made 2 bags and they were both within the last year. LOL at myself. I always thought they had to have special fabrics and would be hard to sew together. It really was an eye opening experience. Totes, bags and purse patterns are the first thing I search for at garage sales, second hand stores and so on now. 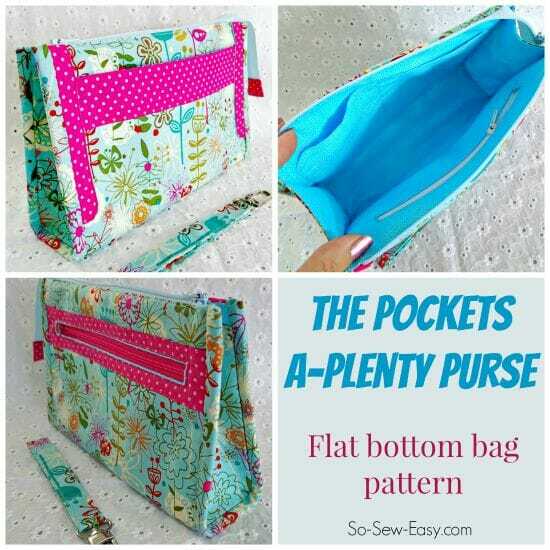 Your purse caught my eye with having all of the pockets and the wonderful fabric that you chose. I certainly pinned it and will have to make one very soon. Thank you for sharing and have a wonderful creative day! Can you try again Daryl. I got confused by time zones and set it to my time, but I think it should be fixed now for everyone to see. Yes it’s now working thank you!